Last year I did a post just like this one and listed what sewing patterns I was looking forward to making in the coming year. I declared that it was not a goal or a promise, just thoughts on what was on my radar for the coming year. Looking back on that list, it is clear that by not making it a commitment, those patterns went unmade, save one. Only 1 out of 10! That is a bit disappointing. My sliver of an excuse was my big move that kept me out of the sewing room for at least 3 months, but still. So this top 10 list is much more of a declaration of sewing challenges I want to climb and clothing items I will actually wear. Imma gonna do it! Fehr Trade XYT top and Greenstyle Creations Stride tights – Workout wear was on the list last year and I’m really going to do it this year. I am a distance runner, I run almost everyday, so I know that making my own athletic wear will be so rewarding and well loved. Procuring good athletic fabric is a big hurtle here, but I just need to buy some. The styles that Melissa offers are unique, fun and practical. She has wrote so many helpful pieces on demystifying the process, too, so it really seems do-able. Rosari skirt by Pauline Alice – I have suddenly become obsessed with all of the patterns that Pauline Alice offers. I remember seeing a dress or 2 of hers a few years ago and not being excited, but all of a sudden now I want them all! This new skirt pattern is so good and I know I will wear it a ton, but what about the Turia overalls? What about the Quart coat? The Malvarosa dress? I could go on and on. A classic French Jacket – Now, I am not going pour 60+ hours into a couture jacket. No, no, no. But I would like to make a machine quilted, tweed coat with some classic details like trim and fringe. I recently tried one on at Nordstrom and felt like exactly 1 million dollars in it. It took every ounce of strength I had to resist buying the beautiful thing – it was on sale for $85 (marked down from like $250) and I knew how beautifully made it was, even if it was not handsewn like a Chanel. Maybe I should have just bought it, since I’m obviously still longing for it. But I knew that there was not room for many such jackets in my ultra casual lifestyle, and I truly want to make one. If I bought the jacket, I probably wouldn’t make one. It will be a labor of love, I’m sure. Boundless Style by Kristiann Boos – This is such a beautiful book to just look at, I might be tempted to use it simply for inspiration. But there are some really intruiguing patterns included in there, and I do love Victory Patterns. I am not much of a fit and flare dress type person, but some of the bodice and sleeve combinations look so cool! I really want to give them a try, and figure out how to incorporate them into my style so I can wear them. No doubt about it, they are tempting! The Sydney or Tokyo jackets by Tessuti – Lightweight and flowy, but still adding style. I have seen beautiful versions of both of these jackets, and I know both or either would slip into my wardrobe as “the third piece” when my outfits get boring and basic. The fabric selection will be endlessly exhilerating. Big bold prints, color, texture, who knows? They are cool shapes and have interesting details and just are not boring! I don’t like to sew basics. Inari T dress by Named Patterns – This is a shape I love to wear! Boxy, simple, but cool and comfortable. I’m not going to lie, I already muslined this up and made a nightgown, and I really like the fit so far. Again, the fabric choices are endless here, and I’m excited to use some unique woven fabrics. I have a couple ideas to try, like changing the neckline up and putting something into those side seams to emphasize the shape. Those special fabrics that have been hiding in my stash for a few better be scared, because this pattern may launch you under my sewing machine. Important question: This style really demands great shoes, does it not? I’m going to need to buy some new ones, right? Classic PJs – My previous sleepwear consisted in the thickest fleece pajamas I could find at Costco. Super glamorous image, right? Well, I realized pretty soon after driving over the state line into California that I was going to need a sleepwear overhaul. I have one lonely pair of Colette Madeline bloomers I made years ago and my husband hates, but I had to wear them every night from August to November. I would like a pair of lightweight classic pajamas that I can mix and match, with pants and shorts, and a matching camisole for really hot nights. I really like the Closet Case Files Carolyn pajamas, but the thought of taping all those PDF pages together sounds awful! I do know that her instructions would be super helpful, though. There is also the Butterick 6296 by Lisette, and I have had very good luck with her patterns in the past. There is also the Lakeside PJ set by Grainline Studios. I guess I have a whole night time wardrobe to make, huh? A Bralette like the Florence by Seamwork or the Anna Crossover by Oh Lulu – I say a bralette because basically I want to get into sewing lingerie “lite”. I don’t want to have to track down too many findings. 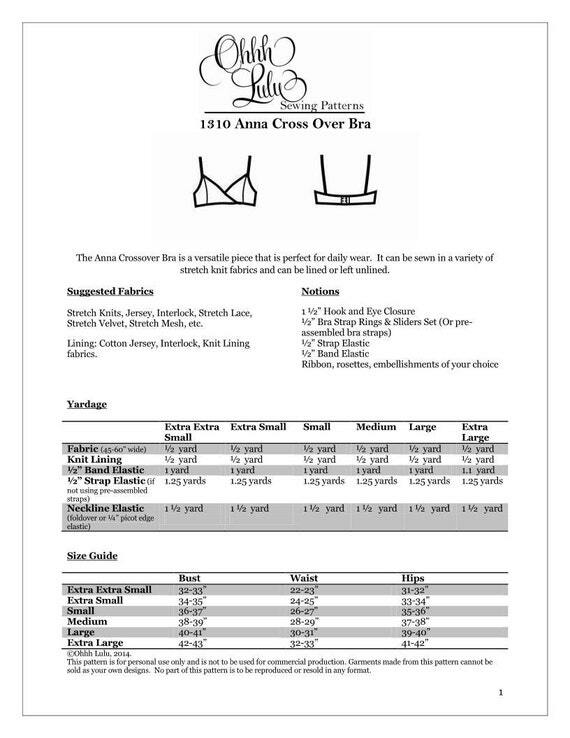 I don’t want to get hung up on “the perfect fitting” bra. But I do want to dip my toe in the water and make something pretty and delicate and learn some new skills. And they actually might be pretty useful to me, since I work from home and avoid putting all that jazz on for real until I absolutely have to, I can just lounge around in a bralette until I’m good and ready to get dressed. It would be a vast improvement over my old Costco tank tops with the built in shelf bra. And I swear I don’t only shop at Costco. Popover shirts, tunics and dresses like the Itch to Stich Mila or McCall’s 6885 – I have 2 tops and 2 dresses that are this shape that I have purchased and love. My problem is that they are fairly boring fabric (white cotton, white silk, chambray and teal rayon, all solid colors) and are always too short! I want my shirts to come to my hip, a tunic that covers my bum, and the dress to come to just above my knee. I also want some print and color! I could really go wild with fabric choices in this shape, too, with the added detail of buttons to play with. As I mentioned last year when I said I wanted to learn button up shirts and collars, I can learn those things here! B6241 jersey dress – This pattern has me all kinds of excited. A cross between athleisure wear and super secret pajamas, but in a dress! It is sporty and cool and made from comfy knit. Look at those gargantuan pockets, too. I imagine myself donning this dress in the morning, loading the pockets up with my phone, snacks, maybe a soda. I’d be set for the day, and would not even need to walk down the long hallway to the kitchen. But no, really, I think I would wear this everyday, and it looks interesting and fun to make. It even has some colorblocking possibilities. Oh, and a zipper. I’m obsessed with zippers. So that’s my crazy list. Will I make all these items? I don’t know, but I do know that I will certainly make more than one of them. And yes, I would feel like a boss if I complete them all. I guess I’m setting my own challenge then! This entry was posted in Uncategorized by Helena@grayallday. Bookmark the permalink. Awesome choices, lots of classic and a fun and funky twist! I want that butterick dress…just ordered it ;). I almost have enough fabric for view C, hope I can creatively lay it out because Lord knows I don’t have anymore room to stash..lol. I’m going to have the exact same problem with that pattern. I never buy that much fabric…but I want to make that dress! Gotta make it work! I love lists like this, a huge part of sewing fun for me is dreaming up all the things I’ll make even if I don’t get around to them. Very inspiring to see what other sewists are excited about so thanks for sharing! Thanks, Elizabeth! I also do A LOT of dreaming. Ha!